McNary’s fall athletic schedules are coming together and if everything sticks the volleyball program will be traveling the most in 2018. Along with non-league weekend tournaments in South Eugene, Medford, West Linn and Portland, the Lady Celts would play conference games in Bend, Summit and Mountain View. The new conference would stick with a Tuesday and Thursday schedule with volleyball teams playing each other twice, home and away. 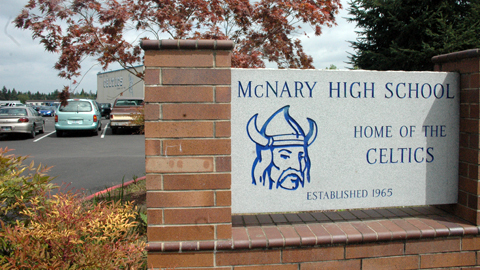 McNary is tentatively scheduled to open the regular season at home against Mountain View on Tuesday, Aug. 28. All three trips to Bend are also scheduled for Tuesdays—Bend High School on Sept. 4, Mountain View on Sept. 25 and Summit on Oct. 2. Junior varsity teams would play at 4 p.m. followed by varsity at 6. McNary’s girls soccer team would do the least amount of traveling in 2018. The Lady Celts would go to Bend only once in the last game of the regular season on Tuesday, Oct. 16. The girls would then play at Mountain View and Summit in 2019. McNary’s non-league games include home contests against Forest Grove, Aloha and St. Mary’s and trips to Oregon City, Sheldon and Lincoln. The boys soccer team would travel to Summit on Friday, Oct. 28 and Mountain View on Tuesday, Oct. 9. The Celtics would host Central, Westview, Centennial and Gresham in non-conference play and travel to Aloha, Canby and Madison. Cross Country wouldn’t travel to Bend until the end of the season for the district meet. The 2019 district meet would then take place in Salem. McNary athletic director Scott Gragg said all schedules are tentative and won’t be finalized until May. Football schedules are still being ironed out.